I'm happy to announce that through an ongoing partnership between Oliphaunt Books and punctum books, the new title Inhuman Nature has just been released. You can download the book or purchase it in hard copy at either site -- but if you do decide to secure the e-version, may I suggest that you make a donation to punctum along the way? If everyone who reads the book in electronic form pays five or ten dollars to support open access publishing, then the impact will be significant. Bear in mind that open access is not free, and a great deal of labor went into producing the volume. 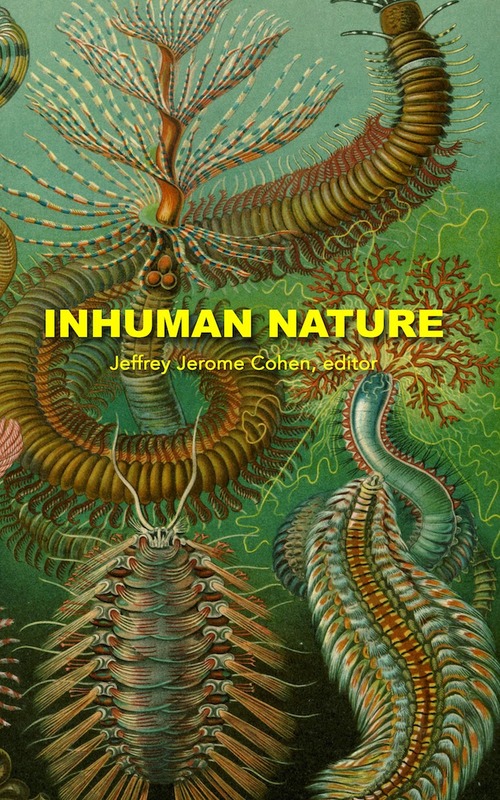 Inhuman Nature is the third title published by Oliphant and would not have been possible without the unflagging support of Eileen Joy. A participant at the panels from which the book derives as well as a longtime forger of new worlds for humanities research, Eileen has both my abiding gratitude and admiration. Oliphant is sponsored by the GW Medieval and Early Modern Studies Institute, a scholarly center funded by a collaboration of the GW Office of the Vice President for Research, the Office of the Provost, and the Columbian College of Arts and Sciences. I am grateful to the twenty-faculty members in nine departments who belong to the center for making it all work, somehow.